Fall 2017 QuickStart Tennis program to be held in Gloucester Twp. What is Gotta Play Tennis Kids? 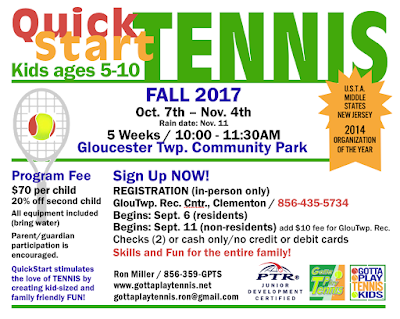 Summer 2017 Tennis in Deptford Twp. has been cancelled due to low registration. Please see information on our Fall 2017 Program available at GlouTwp. Community Park.